Los Indios (The Indians) gets its name from the indigenous trail that runs directly through the launch and over the mountains to the Caribbean side of Costa Rica. Whilst the trail is no longer visible at the launch, you can see parts of it as you fly over the ridge here. 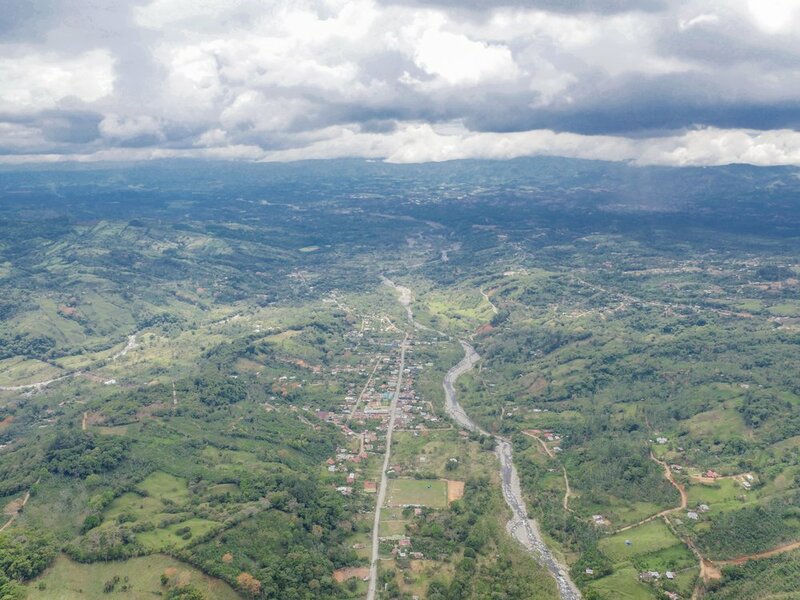 The site sits amongst the foothills of Chirripo National Park which is home to the highest peak in Central America, this is where you can find all the big flying in Costa Rica. The site record, which is held by Zion, is just over 140km to the border with Panama. The valley here has the potential for big triangles, and out and back routes but will take a skilled pilot to navigate over the virgin jungle covering the highest peaks. 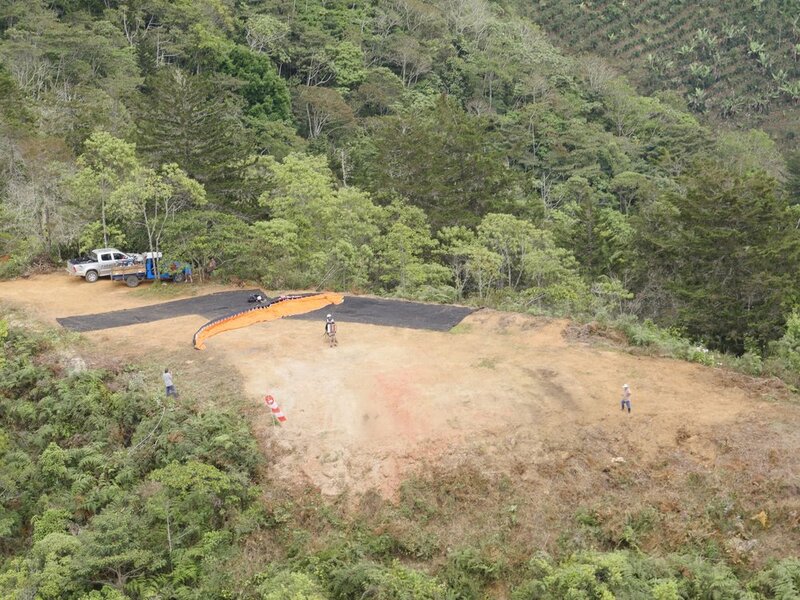 For intermediate pilots, the site is still very much a playground and staying local to practice thermalling and transitions makes small triangles around the immediate valley possible. The launch faces South West into the valley, overlooking the small town of Rivas. From the launch you will see the two sides of the valley, both are great for flying. The wind enters the valley over the Western mountain range seen in the distance which is blowing from the Pacific coast. You might see clouds in the upper layer entering the valley from the North East. This is the prevailing wind blowing in from the Caribbean coast but here it is nothing to worry about, the upper layer of wind is often too high for a paraglider to meet. The site is an early riser and can be working from as early as 9.30 in the morning. The weather is strongest between 12-2 and landing at this time in the soccer field can be turbulent and strong. Beginners should land prior to this time. The launch is often a no wind take-off. You will need to be confident to reverse launch in no wind and commit to running fast or use the forward launch method. We suggest setting your glider up at the back of the take off on the black felt that has been put down to protect your equipment. From here you will have enough space to bring your wing up, check it and run. The official landing is the soccer field in Rivas. This is visible by looking into the valley and following the river South until you see the big green square. Most pilots make an upwind approach in the field behind the viewing stand in the soccer field. The wind on the LZ is nearly always from the South and a windsock has been attached to a fence post for reference. This LZ will require the pilot to reach approx. 100 meters above launch height to glide here from the take-off. It's best to follow the ridgeline towards Rivas before pushing out into the valley to land. Landing at midday can be turbulent, the wind will still be mellow (although the strongest of the day) but the thermals will be punching through. Be patient as you come into land, take the thermal up should it be there and enjoy the flight until a low cycle comes in for a good landing. An emergency landing is available on glide from the take-off. This is located directly below the launch on the widest part of the dirt road. Don't worry about vehicles, the road is quiet and the locals are accustomed to pilots landing here and will stop for you. This is the only stretch of road without power cables, it is not recommended to land in another part of this road or any other road. If you need to emergency land elsewhere it is best to land in the closest soccer field. Every town has one and they are public spaces. Please check for cables around the soccer field, it is likely there will be some. The locals here are friendly and interested in the sport if you need to land on private property. Please make sure you're landing in a cleared field away from crops. Once flying, you will see two grass landing strips. These are used by light aircraft on rare occasions. We have been asked to no longer land here. If you do need to land here in an emergency, choose the grass runway on the East side of the valley and exit the runway as soon as you have landed (there is a small path that shortcuts to the road about halfway along to the East side). You can pack your glider in an alternative space once you have cleared the landing. To cross the valley, get high above launch, we recommend reaching cloud base but anything at about 2000 meters will suffice, the more altitude the better. We recommend crossing directly over towards the closest point and working your way up the ridge to the first peak on the opposite side. Los Pinos (The Pines) seen on the opposing ridge are a great thermal trigger to get high and push out over the town and into the larger valley. From here you will need to connect several thermals before hopping back on to the ridge to the East to fly South. The peak directly behind the launch is a great thermal to fly but try not to get any further back in the valley from it. You will be flying into large venturi should you attempt it. The launch is accessible by car from Rivas but after a certain point, the road becomes gated. Zion Paragliding are the only pilots with access and you will need to arrange to meet or fly with us to come here. As we live only 10 minutes away it's usually no problem and we would be happy to give you a site intro too. GET IN TOUCH IF YOU WANT TO FLY HERE!